Accommodations in our Anacortes, WA bed and breakfast are not only indulgent, but also feature friendly surroundings and use of our home’s common areas. We are located on the main road, close to several restaurants. 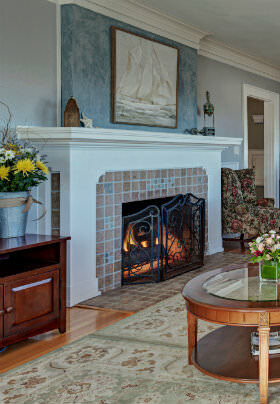 The main floor boasts a Great Room with fireplace, elegant dining room, breakfast nook, and kitchen. The Anchor Room, with attached bath and sitting room, is also located on the main level. The second floor hosts five unique guestrooms – two with queen-size beds, and three with king-size beds. Each room has a private bath. The third floor holds the two remaining guestrooms and baths. In addition to a king-size bed, each room has a twin-size captain’s bunk situated under the window, which doubles as a pleasant window seat in which to curl up and enjoy the scenery or a good book. Our largest room has a small kitchenette, washer/dryer and breakfast nook. Please be aware, We can only accommodate children 12 and up. No pets allowed. We are a NON-SMOKING PROPERTY. This means there is no smoking inside or outside on the property. Washington has legalized recreational and medicinal marijuana, but please note that guests in our Inn are not permitted to smoke any types of cigarettes, cigars, e-cigarettes, marijuana, hookahs, or other types of smoke, either inside the house or outside on our grounds.